LITERATURE professor Dai Jianye became famous online when video clips of his accented, humorous and insightful interpretations of ancient poems went viral on a popular short video platform, drawing nearly 2 million viewers to see. The popularity of the 62-year-old’s lectures is just part of revival in interest in ancient poetry, as new technologies, platforms and programs help elevate the literary works. Several television shows have made ancient poetry lovers and experts into stars, including the hit show “Chinese Poetry Conference” launched in 2016, which was recently won by a poetry-loving fast food courier. Tech giant Tencent has included poetry features in its games and developed a specific puzzle game, while artificial intelligence pioneer Baidu has designed a special program to create poetry based on big data analysis of thousands of ancient poems. “Technology and culture can go hand in hand, and the former can help connect the latter with the modern world in a smart and subtle way,” said Wang Xiaobing, director of Tencent Research, which organized a cultural forum where senior poetry researchers were able to share their perspectives on the relevance of poetry in the digital world. “The conference hall was surprisingly fully packed,” Wang said. An online survey of about 100,000 respondents last year showed that ancient poetry was the most popular traditional cultural interest among the post-90s generation of netizens. “Ancient poems, despite being written a long time ago, have lasting inspiration and healing power for the Chinese,” said Xue Tianwei, former director of a research institute on famous Tang Dynasty (618-907) poet Li Bai, whose classic line “All things in their being are good for something” is one of Xue’s favorites. 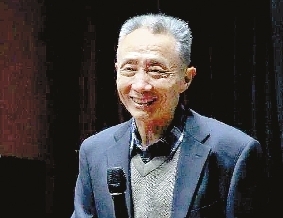 Since he gained overnight fame, Dai’s previous books on poetry and other Chinese classical literature have become bestsellers.